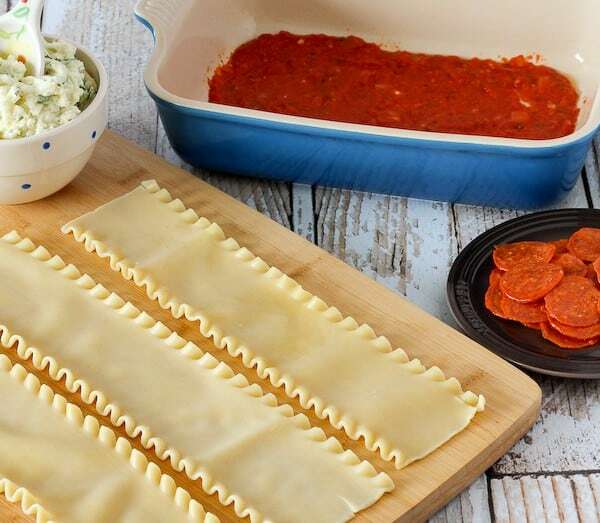 These pizza lasagna rolls are a fun meal that the whole family will love — what’s not to love about pizza and lasagna? With a little planning ahead, they are a great weeknight meal. This post is sponsored by KRAFT. All opinions are my own. 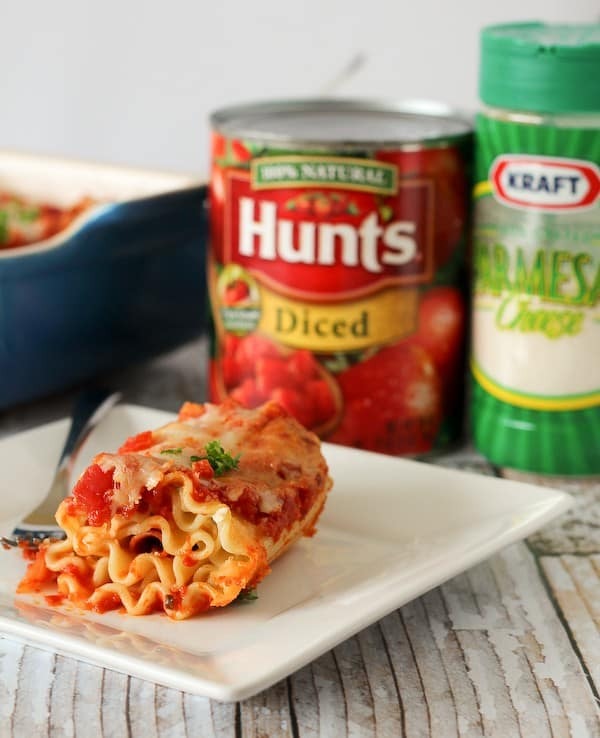 Have a stocked pantry — in my first post in this series, I told you why KRAFT Grated Parmesan Cheese and HUNT’s Diced Tomatoes have a spot in my fridge/pantry. This recipe focuses on planning ahead. Next week I’ll bring you a recipe that can be created with all pantry staples. (This one can too, actually, depending on your definition of “stocked.”) This recipe would be a great one to prep the day ahead and eat the following day. At first glance, this recipe might seem fancy and complicated. They are pretty little lasagna rolls, after all. The great thing about this recipe is that it can be prepared in advance. Even over a couple of days! Make the sauce Saturday, make the rolls Sunday, and you’ve got an amazing dinner to look forward to on Monday. All you’ll have to do is throw it in the oven when you get home from work or your play date or whatever Monday might hold. We all know Monday could use all the help it can get, so having dinner waiting in the fridge for you is definitely something to look forward to at the end of the day. 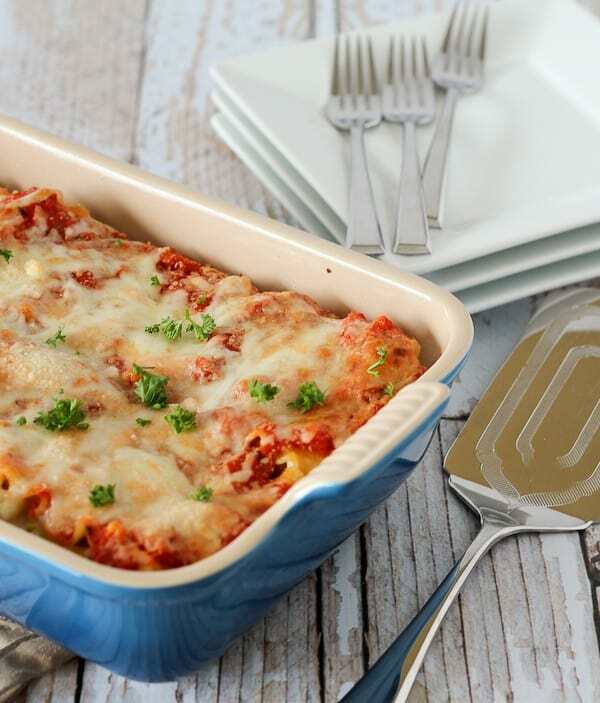 The sauce used in these lasagna rolls is a simple pizza sauce made with HUNT’s Diced Tomatoes. You could used crushed tomatoes for this recipe and skip the puréeing step if you have those on hand. I chose to use the diced tomatoes because they are one of my pantry staples. I like them because they have multiple functions and can be used for traditional things such as beefing up a soup or chili but they can also be quickly puréed for a sauce such as this one. I used my immersion blender to purée the sauce but you may also use a blender or a food processor. Always be careful when puréeing hot, red liquids! And wear an apron. 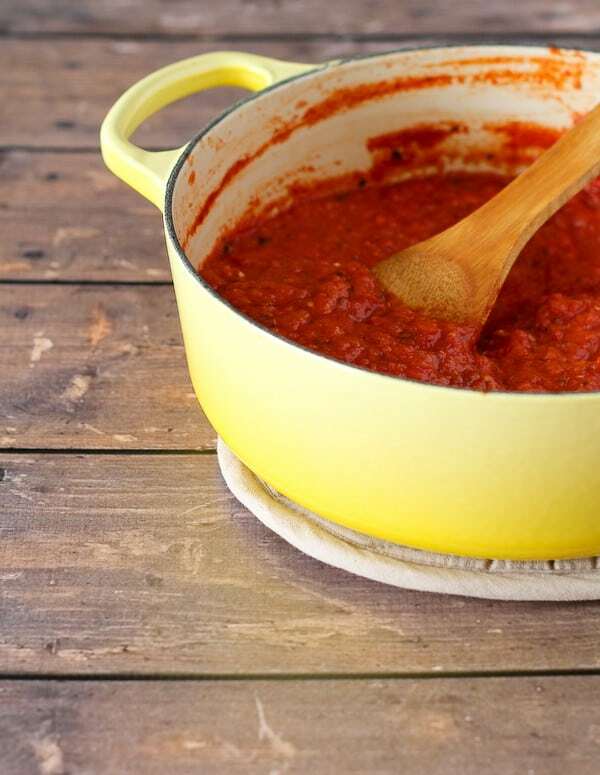 Plan to make this sauce a day or two in advance and have it ready for this recipe. The sauce is really simple to make and is mostly hands-off time for it to simmer and for the flavors to meld. The next step is making a quick mixture to fill the rolls with. It starts with KRAFT Grated Parmesan Cheese, ricotta cheese, mozzarella cheese, and some parsley. Throw in a beaten egg to help bind the mixture together. 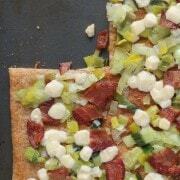 This mixture gets spread on cooked lasagna noodles and topped with slices of pepperoni. 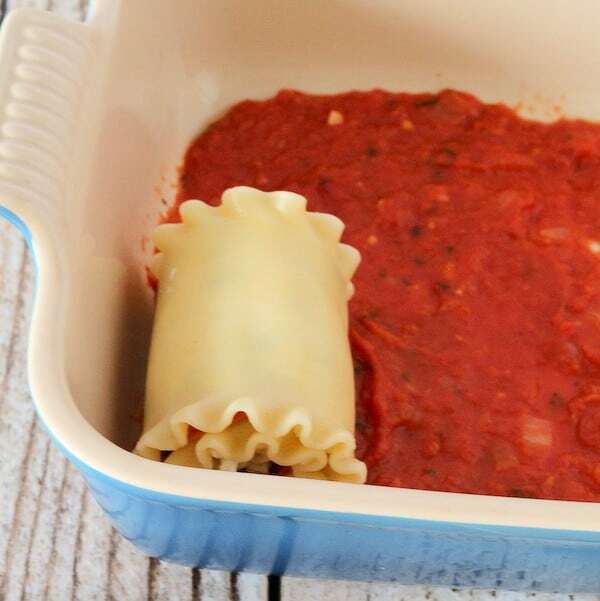 You then roll them up and place them seam side down in a baking dish that has been sprayed and given a layer of that delicious homemade pizza sauce. Repeat with each lasagna noodle until they are all filled! 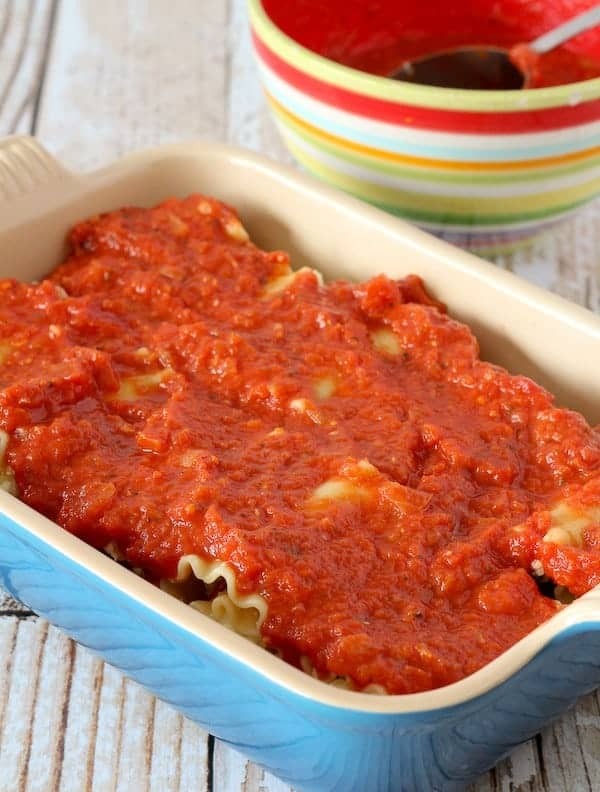 Then you spoon more of that delicious sauce over all the filled lasagna rolls. Top with more great cheese…. This is when you would cover with foil and refrigerate if you were making this a day in advance. When you’re ready, you’ll stick it in a preheated oven and bake until heated through, golden brown and bubbling. And clearly, the best part of the whole process is serving these up and eating them! I let my pan rest for about 10 minutes just for everything to come back together a little. This makes it easier to serve. In a large pan over medium-low heat, heat the butter and olive oil until the butter is melted. Add the garlic and onion and saute until tender, about five minutes. Stir in HUNT’s Tomatoes, tomato paste, basil, oregano, sugar, and red pepper flakes. Bring the sauce to a boil and then reduce heat to low. Place a cover on the pan, tilted slightly to let some steam out. Preheat oven to 350 degrees Fahrenheit. Cook noodles according to directions on package — once cooked, drain and rinse with cold water and lay out on sheets of wax paper so they don’t stick together. Spray a baking dish with nonstick cooking spray and spread 1/2 cup of pizza sauce into the bottom of the pan. Set aside. Meanwhile, prepare filling in a large bowl by mixing beaten egg, ricotta cheese, 1 cup mozzarella, 1/2 cup grated KRAFT Parmesan cheese, parsley and pepper until well combined. 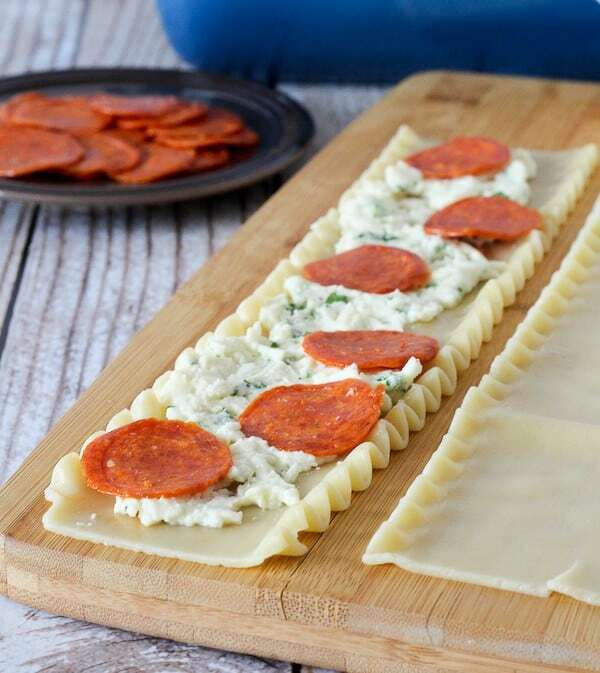 To prepare lasagna rolls, lay out one lasagna noodle and spread it with about 2 tablespoons of cheese filling. Lay out 5-6 pepperoni on top of cheese filling. Roll up each noodle starting at one of the short ends. Place in prepared baking dish, seam side down. Repeat until all noodles have been filed and rolled. 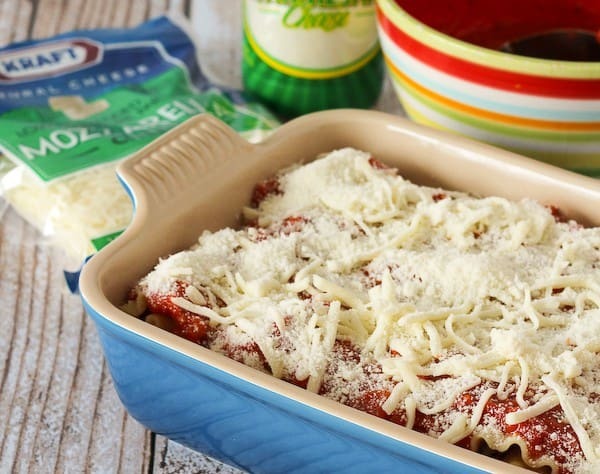 Pour 1 and 1/2 cups pizza sauce over the rolls and top with 1/2 cup mozzarella cheese and 1/4 cup KRAFT Parmesan cheese. Cover baking dish with foil and bake for 45-50 minutes (remove foil for last 10-15 minutes) or until hot and cheese is melted. Let stand about 10 minutes prior to serving. Note: May be prepared in advance and baked the next day. 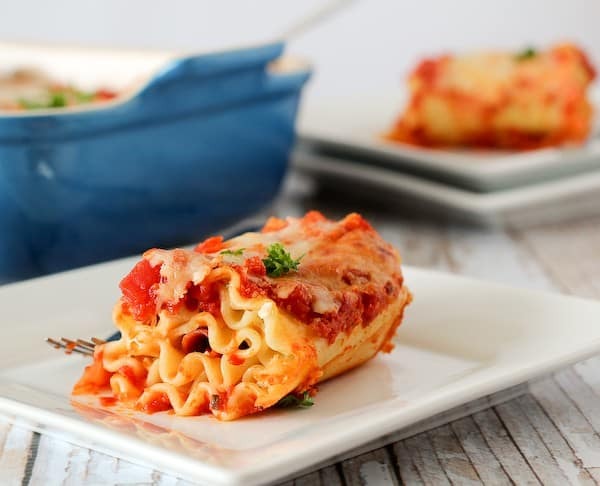 Verdict: We all loved these pizza lasagna rolls. What is there not to love about pepperoni, cheese, pasta and homemade sauce? Changes I would make: None are necessary, but knowing me, I’d probably “health” it up a little next time with some chopped spinach. 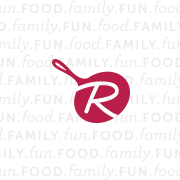 Follow Rachel Cooks | Rachel Gurk’s board Pasta on Pinterest. Still need more “Inspired Authenticity, Weeknight Simplicity” inspiration? I have a Pinterest board devoted to the subject and you can also check out KRAFT’s Facebook and Pinterest pages for tons of great recipes. Disclosure: I am working in partnership with the KRAFT brand and I am receiving compensation for my participation in this campaign. All thoughts/opinions are 100% my own. This was very good! Everyone in the house liked it! I don’t think I’d really consider this an easy recipe for everyone. It wasnt real difficult for me but I know it would be for someone who doesn’t cook all the time. So glad you liked it! Thanks for the feedback regarding difficulty level. It’s a little tedious but I didn’t consider it difficult. It’s always nice to hear another opinion! So glad you like them! Thank you for taking the time to come back and comment, it means so much! I tried this and it was good did my own tweeking, no disrespect. My filling was mozzarella,cottage cheese and portabella mushrooms, spinach, and asparagus Spears cut to spread out. I used your topping and everything else. As like you I am a kraft and hunts woman. With the spinach hidden they thought it was paraley. Thanks for sharing love it! I love your adaptations — sounds wonderful! Would you recommend any changes in cooking instructions if I intend to freeze an entire pan to eat later? I’ve never done it, but I’d cook it directly from the freezer, covered for the first hour. I don’t know how long it will take exactly after that, but I’m guessing it will take quite a while to bake completely. Pingback: How I feed my family for less than $300/month. | Love. Marriage. Baby Carriage. These were delicious, thank you! I threw a chopped green pepper in the ricotta mix to get more veg. Going into my recipe book for sure. Great idea! Thanks for letting me know you liked them! 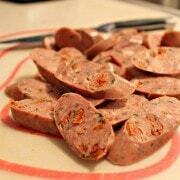 Pingback: Menu and Recipes Week of January 26th | What's in Peter's Pan? Made this tonight for the first time. Pretty good, but I think next time I will use a bit more seasoning. It is a bit time consuming to make, but well worth it in the end. Thanks for a great recipe! I don’t normally leave reviews but this recipe was GREAT! Followed it as written. Family loved it. The sauce is wonderful. Will be making more of the sauce and freezing. I have to try this! (It might even make a Pintesting blog post?) Have you tried making and freezing this? I’m trying to do some freezer-friendly meal ideas. It looks totally delish! I haven’t frozen it but I think it would freeze great! Hope you love it. Did you end up freezing it? How did it turn out ? I have not frozen this but I don’t see any reason why it wouldn’t freeze well! This could be one of my family’s new favorites!! It was so good! The only thing I did different was add some sausage to my sauce! It was so DELICIOUS!! This is by far, the BEST recipe I have gotten off Pinterest!! It is easy, and taste amazing!!!!!! Thanks for sharing!! That is such a great compliment! Thank you! Thee look awesome! 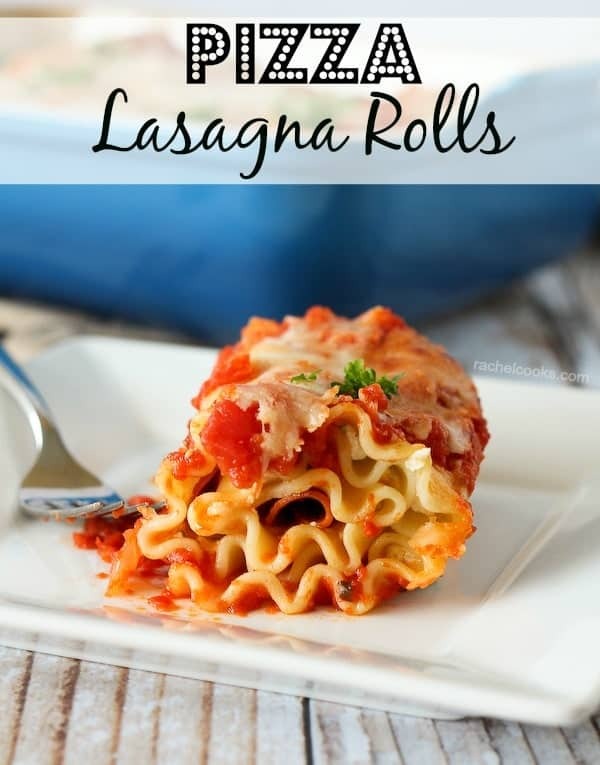 I love making lasagna rolls because they are so easy! Love this idea. These would seriously be gone in like five seconds in my house! These would be a hit at our house…the kiddos would love them. I agree…spinach would be a great addition! Yum! I would add spinach too. We pretty much love pepperoni pizza in our house. Now that you’ve made it into an easy pasta dish – it makes it even better. 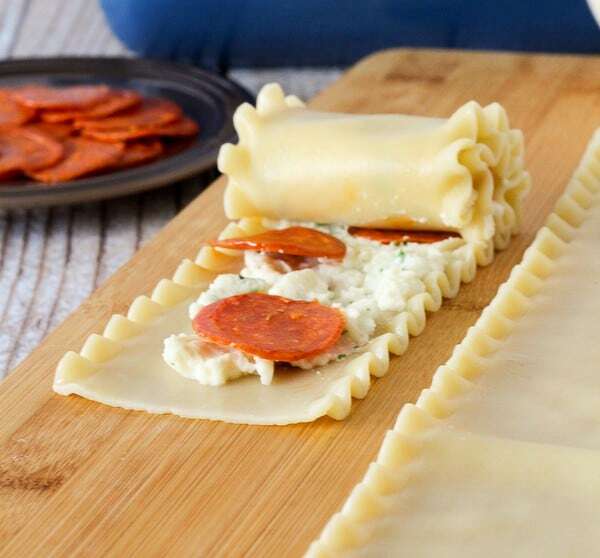 I love lasagna rolls on their own, but PIZZA lasagna rolls takes them to a whole new level of goodness! How did you know I had leftover pizza sauce, pepperoni and parmesan cheese in my fridge? :-) Also that I need a meal for tomorrow night. I just hope I can find gluten-free lasagna noodles. :-P Thanks for this; I’ll try it even if it’s not gluten-free! Oooh I hope you love it! These look fantastic-gorgeous pictures! What a great suggestion for quick meal planning too! I checked out the pinterest board and have pinned away because all those ideas are great and look so yummy. YUMMM! My kids will basically eat anything with the word pizza in it, so I bet these would be a big hit. Can’t wait to try them. This suits me down to the ground. I would be perfectly happy eating this until it was all gone.